7 March 2016, at 6:00a.m. CANADA - Last commentary I started a fool’s errand (which I’ve done before) of commenting on the future. I suggested for Canada that we might be heading back to the future, writes Bob Fraser, Sales & Service, Genesus Ontario. By that I meant with the dramatic shift in our currency from par to the US dollar to approximately seventy cents, repeal of COOL, a weak packing industry and a shortage of capacity (certainly in Ontario) we might return like the turn of the millennium with significant numbers of SEW/feeder pigs and market hogs making the trek to the US Midwest. The chart below gives a report card of how that prediction is shaping up six weeks into the New Year. 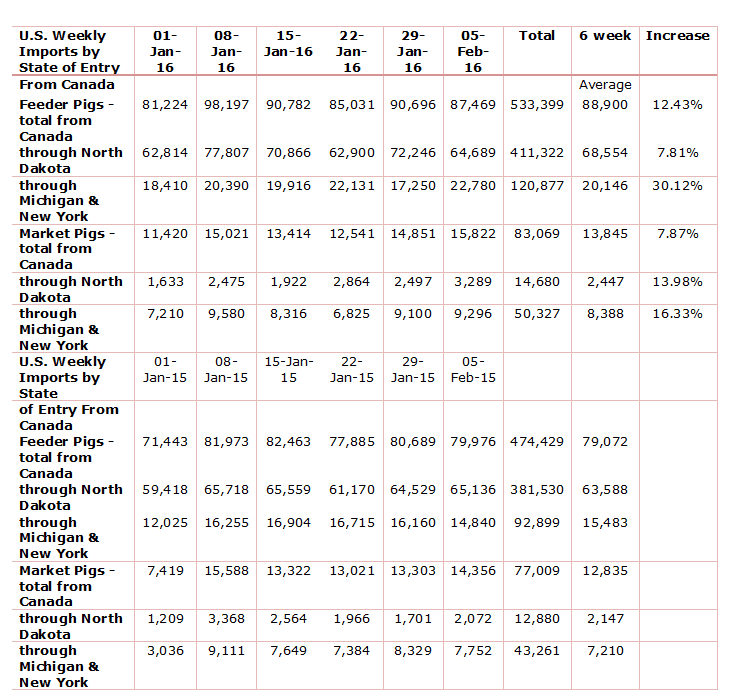 SEW/feeder pigs are up 12.43 per cent year over year, with the west (primarily Manitoba) up 7.81 per cent and the east (primarily Ontario) up a whopping 30.12 per cent. Market hogs up 7.87 per cent year over year, with the west (primarily Manitoba) up 13.98 per cent and the east (primarily Ontario) up a 16.33 per cent. The very significant increases out of Ontario I believe are explained by necessity being the mother of invention. As I’ve commented in the past Ontario are short approximately 25,000 shackles of packing capacity with the closure of Quality Meat Packers coming on two years ago. Many Ontario producers have been severely challenged particularly in the last 3 or 4 months getting their hogs slaughtered in an effective and profitable matter. 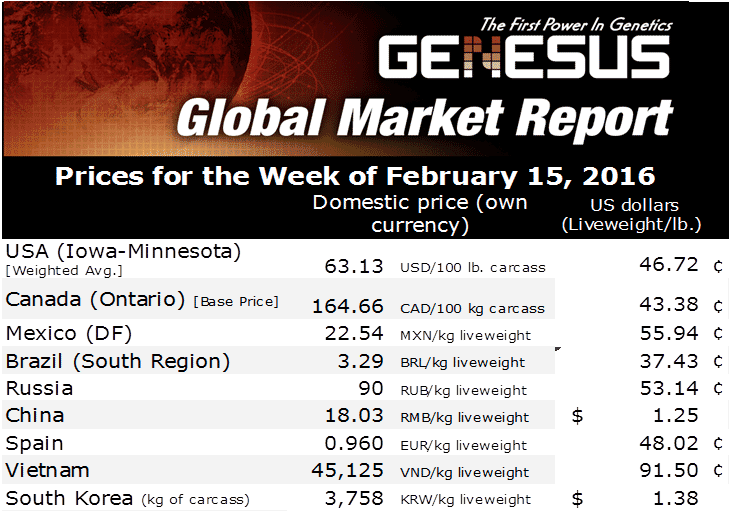 Further last week’s USDA – LS255 National Direct Delivered Feeder Pig Report placed cash SEWs at $60.35 US and 40 lb. feeder pigs at $76.48 US, with our present exchange rate that translates to approximately $83.28 Cdn and $105.54 Cdn respectively. That’s what we might call the easy trade, even for a Canadian farrow to finish producer particularly if he’s struggling to get his pig slaughtered whether he can improve on his situation by finishing his hog through. So my fool’s errand is trending my way at least for right now. Therefore I’m emboldened to further predict this flow will do nothing but accelerate. Such that we will be running 100,000+ SEW/feeder pigs per week south before the quarter is out. This in turn may have Canadian packers scratching for supply even before summer. Ontario Pork Congress (June 22, 23) could see some role reversal between packer and producer from last year. As they say “time will tell”. One final observation from Kevin Grier’s Canadian Pork Market Review – interesting stat/piece of trivia. However may well have consequences for Canada as the US discovers the “live by the sword die by the sword” realities of coming to increasingly rely on exports for your hog price. It is interesting to note that U.S. pork production went above beef production in 2015 and pork is expected to be greater than beef production in 2016 as well. Last year was the first year that U.S. pork production went above U.S. beef production. Broiler production has been number one in the United States for many years. In Canada, pork production has outpaced beef for decades, while chicken production exceeded beef starting in 2012. Pork remains much larger in terms of production in Canada compared to both beef and chicken.